If you like a great Caesar salad or a spicy ramen soup, give this dish a chance. Gochujang is traditionally made with chili peppers, fermented soybeans, brown sugar, glutinous rice and salt – but that may not make your mouth water. Think of spicy, a hint of sweetness, and a bit of umami (thanks to the fermentation) smooched up together. Umami is commonly talked about as the fifth taste, in conjunction with salty, sour, sweet and bitter. Its simplest definition is “savory,” and to think about what that means, think about how your taste buds respond when you are eating foods such as mushrooms, Parmesan cheese, soy sauce, anchovies, miso, meat or a rich soup. The fish sauce, made with fermented anchovies, adds to the whole umami thing as well. Both gochujang and fish sauce are available in Asian markets and well-stocked supermarkets, and both are readily available online. If you don’t have gochujang, you can substitute other hot sauces and add a hefty pinch of brown sugar. And if you don’t have fish sauce, soy sauce will do in a pinch (different, but still delicious). Hey, listen, I’m aware that many people reading all of this might think, “Whaaaaat?” For many Western cooks, words like “fermented anchovies” don’t spark joy in our hearts. But boy, if you like foods like a great Caesar salad or a spicy ramen soup, then take a little chance and give this dish and these ingredients a go. And by all means, let me know what you think – my neighbor and I want to know. Preheat the oven to 400 F. Spray a rimmed baking sheet with nonstick cooking spray. 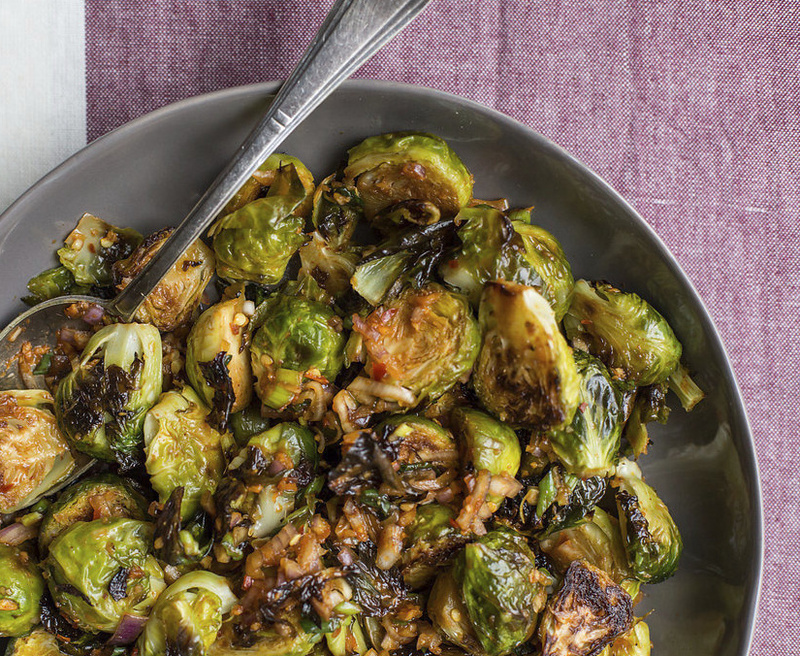 Place the Brussels sprouts together on the baking sheet, drizzle the olive oil over them, sprinkle with salt and toss. Spread the Brussels sprouts out on the sheet and bake for about 20 minutes, until they are just tender and browned in spots. Meanwhile, place the fish sauce, sugar, garlic, ginger and gochujang paste in a food processor and process to combine. Turn the mixture into a large bowl and stir in the chili flakes, scallions and red onion. Add the cooked Brussels sprouts to the bowl and toss so they are well-coated with the dressing. Serve warm.